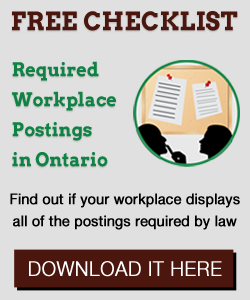 In 2017, the provincial legislature and Ontario judges continued to change Ontario’s employment laws. These changes resulted in higher payroll costs and a more regulated workplace. This blog briefly identifies 10 employment law developments from the past year. Should employers talk about mental health in the workplace? Recent news in the media has highlighted competing perspectives on mental health, one story focusing on the importance of mental health privacy, and the other campaigning for speaking out about mental health. Wednesday Jan 27, 2016 has been designated as the Bell Let’s Talk day, meaning let’s talk about mental illness, as part of Bell’s multi-year campaign around the issue. This seems in contrast to a recent human rights decision about student mental health privacy rights at York University. Three popular articles this week on HRinfodesk deal with AODA January 1, 2017 compliance deadline; performance based incentives; and, the use of medical marijuana in the workplace. Last year, proposed changes to the Customer Service Standard under the Accessibility for Ontarians with Disabilities Act, 2005 (“AODA”), were made available for public comment. A finalized version of these proposed changes has now been released. The purpose of many of the changes is to streamline the Customer Service Standard with the Integrated Accessibility Standard (which includes the Information and Communication Standard, the Employment Standard, the Transportation Standard and the Design of Public Spaces Standard). The Mayo Moran Review of the Accessibility for Ontarians with Disabilities Act is both a welcome and timely document as it reflects the progressive goal of inclusion within business and social culture. People with disabilities have traditionally been excluded from decision-making, holding roles of importance, exercising personal autonomy and obtaining gainful employment. Although the view prescribed to people with disabilities has shifted over the years, there persists an underlying theme in which the overarching narrative is one of cultural mistrust.